Mitochondria (singular mitochondrion) are the source of energy production within eukaryotic cells. They are semiautonomous and self reproducing organelles, residing in the cytoplasm. Converting cellular energy metabolites in the Krebs Cycle, through the process of oxidative phosphorylation they produce adenosine triphosphate (ATP), which is used to power other processes in the cell. Their function is essential to efficient energy production. Without them eukaryotic cells would be dependent on anaerobic glycolysis for their ATP. Glycolysis releases very little free energy but in the mitochondria the metabolism of sugars is much more efficient and provides 15 times more ATP than is produced through glycolysis. Mitochondria take up a large portion of the cytoplasmic volume of eukaryotic cells. They are rod shapedorganelles with an inner and an outer membrane. The outer membrane limits the organelle. The inner membrane folds in on itself forming the cristae mitochondriales, giving the appearance of partitions and chambers within the organelle in cross section. The cristae number and shape vary according to the type of tissue and organism. 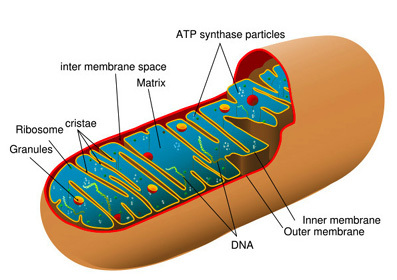 Cristae serve to increase the surface area of the inner membrane..
Mitochondria contain their own genome which is separate and distinct from the genome of the cell. Theoretically, mitochondria may have been separate unicellular organisms at one time and were subsumed in a symbiotic relationship into eukaryotic cells at some point in the evolutionary process. The similarity of genes between the mitochondrial genome and the Rickettsia prowazekii genome suggests this bacteria is the most closely related to mitochondria to date. Usually seen as inflexible cylinders of roughly 0.5–1 μm, mitochondria resemble bacteria. Mitochondria are actual very mobile and frequently change shape. They may even fuse with other mitochondria and then separate. They are often associated with microtubules in the cytoplasm which determine mitochondrial orientation and distribution. In some cells they form long moving chains and in other types of cells they remain fixed in a position providing ATP directly to a site of high ATP consumption such as the adjacent myofibrils of cardiac muscle or the flagellum of sperm. Mitochondria were first seen in a light microscope in the nineteenth century but were not really understood until procedures for isolating intact samples were developed in 1948. Mitochondria are often retrieved from purified liver cells which contain from 1000 to 2000 mitochondria each, occupying about one-fifth of the cell volume. There are two structurally and distinct membranes and two internal compartments or spaces. The two membranes are separated by the inter-membrane space. The space enclosed within the inner membrane is the matrix, a moderately dense region with strands of DNA, ribosomes, or small granules with which the mitochondria code for a portion of their own proteins. The external membrane of the mitochondria contain the transport protein porin. Porin forms aqueous channels through the lipid bilayer of the mitochondria, resembling a permeable sieve through which molecules, including small proteins, of 5 kiloDaltons or less may pass into the inter-membrane space. The inner membrane, by comparison, is impermeable to most molecules. In other words, the inter-membrane space is chemically like the cytosol while the internal matrix of the mitochondria contains a select set of molecules. The inner membrane constitutes the framework for electron-transport processes that produce most of the cell's ATP. Enzymes embedded in the inner mitochondrial membrane are essential to the process of oxidative phosphorylation generating most of the animal cell ATP. Extremely convoluted, its infolding form the cristae that project into the matrix of the inner compartment of the mitochondrion and significantly increase the area of the inner membrane. Cristae vary in volume for different types of cells. The number of cristae in a mitochondria in a myocardial cell, for example, is three times that of mitochondria in a liver cell. There is also a greater demand for ATP in myocardial cells than in liver cells. In prokaryotes, the plasma membrane is used to produce ATP. However, eukaryotic cells reserve this function for membranes in energy converting organelles, mitochondria and plastids and the plasma membrane is reserved for other transport processes. Mitochondria and plastids are morphologically notable for their extensive inner membranes. The inner membrane is a lipid bilayer containing a high proportion of cardiolipin (diphosphatidylglycerol). It sufficiently reduces the membrane’s permeability to protons making the membrane especially impermeable to ions and establishing the conditions that allow a proton-motive force to be established across it. The inner membrane also holds a number of different transport proteins which make it selectively permeable to smaller molecules that are metabolised or utilised in mitochondrial enzymes in the matrix. Protein constitutes a higher percentage of the inner membrane than in any other membrane of the cell, 76 percent. The inner membrane contains many protein-rich intramembrane particles including the F0F1 complexes that synthesize ATP and those that transport electrons to O2 from NADH or reduced flavin adenine dinucleotide (FADH2). The inner membrane also hold transport proteins which pass impermeable molecules, such as ADP and Pi, to pass from the cytosol of the inter-membrane space through the inner membrane to the internal matrix. The proteins also transport other molecules in reverse, such as ATP, from the matrix into the cytosol. Along with the inner membrane, the matrix contained in the internal compartment of the mitochondria is the primary functional area of the mitochondria. The matrix includes enzymes that metabolise pyruvate and fatty acids to produce acetyl CoA along with enzymes that oxidise acetyl CoA in the Kreb's cycle. The Kreb's cycle produces, amongst other things, NDAH which is the primary source of electrons transported through the respiratory chain. The respiratory chain enzymes are embedded in the inner mitochondrial membrane, essential there to the process of oxidative phosphorylation. In a process similar to replication in bacterial cells, when a mitochondrion reaches a certain size, they undergo fission, the furrowing of the inner and outermembrane which pinches them into two daughter mitochondria. Prior to fission they replicate their DNA. Mitochondrion at the end of their life are disposed of through autophagy. Cellular endoplasmic reticulum are wrapped around the mitochondrion forming a vacuole. Golgi complex vesicles containing hydrolases then join with the autophagic vacuole which then degrades the contents of the vacuole, the mitochondrion. Mitochondrial uniporter in the inner membrane move Ca2+ into the matrix which in turn initiates activation of dehydrogenases in the citric acid cycle, the cellular concentrations of Ca2+ essentially triggering variations in mitochondrion activity. This establishes a clear link between energy metabolism and cellular activity involving a functional relationship with endoplasmic reticulum. Ca2+ uptake is apparently rapid while the Ca2+is then released back into the cell over a longer period, indicating that the mitochondria act as a buffer. This buffering function has an impact on presynaptic terminal potentials and may be involved in the propagation of cytosolic Ca2+ waves. Overloading mitochondria with Ca2+ may be linked to neuron apoptosis (cell death) through two possible results: (a) decrease or loss of inner mitochondrial membrane proton gradient leading to termination of the production of ATP; (b) proactive substances such as cytochrome c may be released into the protoplasm of the cell. These proactive substances will in turn activate caspases which will result in necrosis or apoptosis according the extent of the loss ATP production and survival of sufficient numbers of mitochondria. ↑ Usually rod shaped. they may also be round. ↑ 11.0 11.1 11.2 11.3 11.4 Oxidation of Glucose and Fatty Acids to CO2 Lodish, Harvey; Berk, Arnold; Zipursky, S. Lawrence; Matsudaira, Paul; Baltimore, David; Darnell, James E. (2000) Molecular Cell Biology. 4th ed. New York: W. H. Freeman & Co. This page was last modified 00:41, 17 October 2014.